A few weeks ago, I was given the opportunity to try out something a little different to the usual review requests I recieve...the Mum-Made box from the people behind Toucan Box. If you're not familiar with Toucan Box, they are a fantastic craft box subscription service for little ones - ideal for not-very-crafty mums like me who have the desire to spend some quality time doing crafts with our children but not the know-how as the boxes come will easy to follow step by step instructions to help you complete each craft. Tyne has been getting Toucan Boxes for over a year now and we both look forward to them arriving each fortnight, so to see a new box from the same company aimed at mums piqued my interest! The Mum-Made box offers mums the chance to spend some me time making something beautiful for their child - there are a few different boxes on offer at the moment, but the one I was sent to try out was the nightlight. The box arrived quickly, and I was excited to give it a try but also a little apprehensive as like I say...I am NOT the crafty type! I am rubbish with anything like this, and was quite confident that I would find a way to mess it all up! But after a stressful day, I took myself to my bedroom once the little ones were asleep armed with a coffee, some Tori Amos on my ipod, and my Mum-Made box - and I have to say, just that experience alone was bliss! I'm the kind of person who puts myself last on the list of priorities over and over again, so to do something that meant I had some time out on my own was so therapeutic. Usually whenever I try this I end with a racing mind, going over to-do lists or shopping lists in my head, but having the craft to focus on allowed me to quiet my mind and just BE...for probably the first time in a long time! As for the craft itself, the instructions were very detailed and very easy to understand complete with pictures to help. The box contained pretty much everything I needed to complete the project except for scissors and a ruler - the needle, thread, sticky tabs, and everything else were in the box waiting for me! I began by making a series of braids, followed by some tassles which was actually quite fun! I'd never thought about how to make a tassle before and I quite enjoyed the process! Then it was time for the part I was most unsure of - the stitching! I haven't done any sewing since primary school! 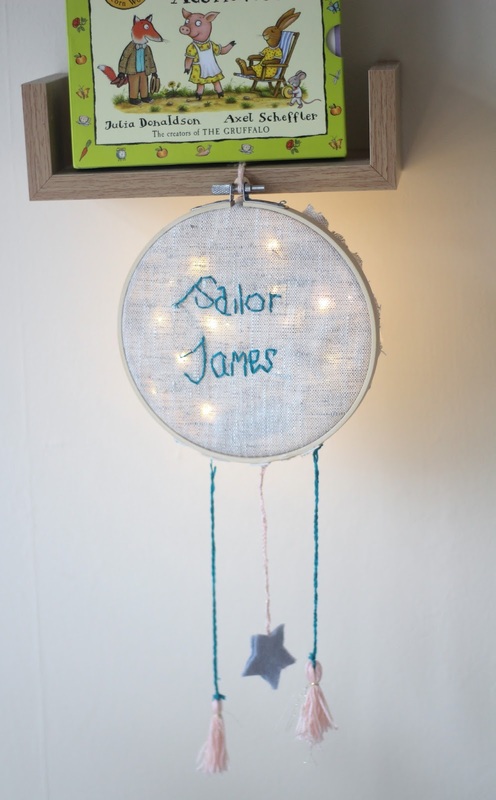 The set came with a ready made template with the words Sweet Dreams....I could have taken the easier option and stitched this onto my nightlight, but I chose to do my own thing using the blank template instead and stitch my youngest childs name onto it. Sailor, as the third baby, often gets the short end of the stick and despite the fact that he's 18 months old I have yet to hand make anything for him whereas I made things for each of his brothers rooms before they were born....eeeek! Now it may not be perfect, but I tried my best and to be honest I am happy with the results - yes the stitching leaves a lot to be desired but I think it just adds to the charm! The nightlight looks adorable hung up in Sailors bedroom. It came with a set of mini fairy lights to put in the back too, for a beautiful finishing touch. I thoroughly enjoyed using the Mum-Made box, and I have my eye on the Bunting box next - it looks absolutely adorable!! 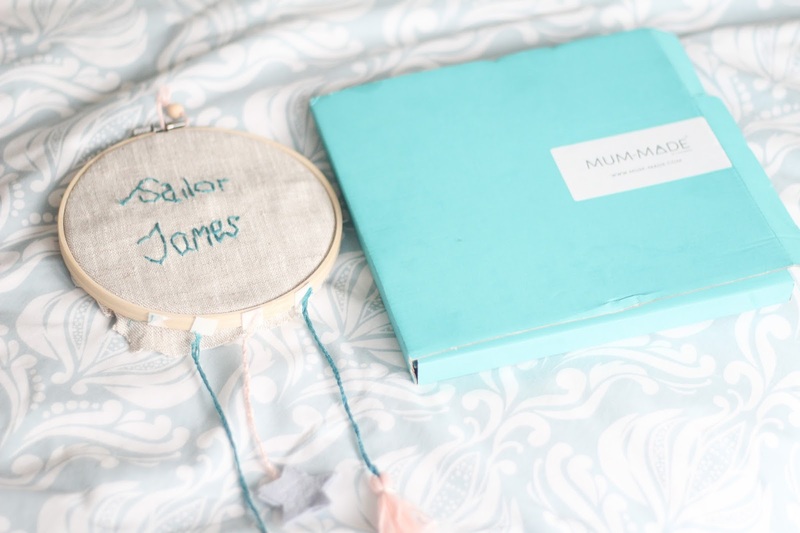 If you enjoy crafting or would like to just take some time out for yourself and make a beautiful keepsake for your child, I highly recommend the Mum-Made box. Boxes are available from www.mum-made.com priced at £19.90 each, but you can get 10% off with the code SAS17. *With thanks to Mum-Made for collaborating with us on this post.